Philippe has started visiting us last spring, his teeth were in quite a bad condition. His treatment has started with a first consultation when he landed in Budapest in mid May. Five months later he came back by plane to get his dental implants. This procedure took only 2 days, there was a healing period for 8 months before continuing the work. It was fascinating to see the hope on his face at the beginning of each treatment and the satisfaction in his eyes when he left with the smile, he has always dreamed of. 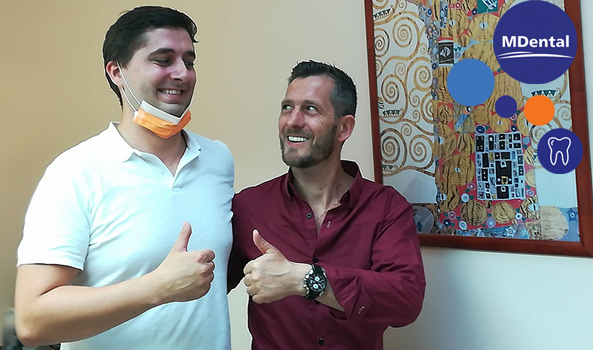 Our oral surgeon, Dr. Bodnár was just as happy as Philippe when he finished putting shiny bridges on his dental implants at the end of the treatment. Thank you, Philippe, for choosing MDental Clinic Hungary and see you again for your first annual dental check-up!